Two of my favorite fellow bloggers have covered the Uni-Ball Jetstream 101 already (Brian at Office Supply Geek and Chris from Pens'n'Paper as a guest post on this blog), so I figured it was about time to toss my hat into the ring and see what this latest entry into the Jetstream line has to offer. It is certainly as smooth as smooth can be, but where does it fit in the ever expanding Jetstream lineup? Prior to starting this blog, I gave the original standard Jetstream - the one you can find in stores everywhere - a spin, and wasn't sure what all of the hype was about. The 1.0mm tip skipped too much, leaving a not so solid line on the page. I swore them off for the longest time, but once I found that an 0.7mm version existed, and then subsequently the 0.5mm, I became hopelessly hooked for life. I still don't use the 1.0mm version very frequently (although it is Mrs. Pen Addict's current favorite pen), but from a writing perspective, the 101 does a superb job, and is much better than the original Jetstreams I tried way back in the day. But why does this pen exist? Aren't there enough types of Jetstreams already available? Well, new pens are always nice, but I think this one boils down to price. If you take a look at Staples.com, the 101's sell for $13.99 a dozen, while the standard capped go for $29.99, and the retractable for even more at $32.99. Which one do you think your office manager can justify more, and still get Bob and Jane their beloved Jetstreams? Well played, Uni-Ball. Well played. If you like the more generic barrel style (kind of a souped-up Bic Stic), this pen writes just as good as the rest. But since it only comes in the 1.0mm tip size right now, I think I'll stick with my favorite 0.5mm models. 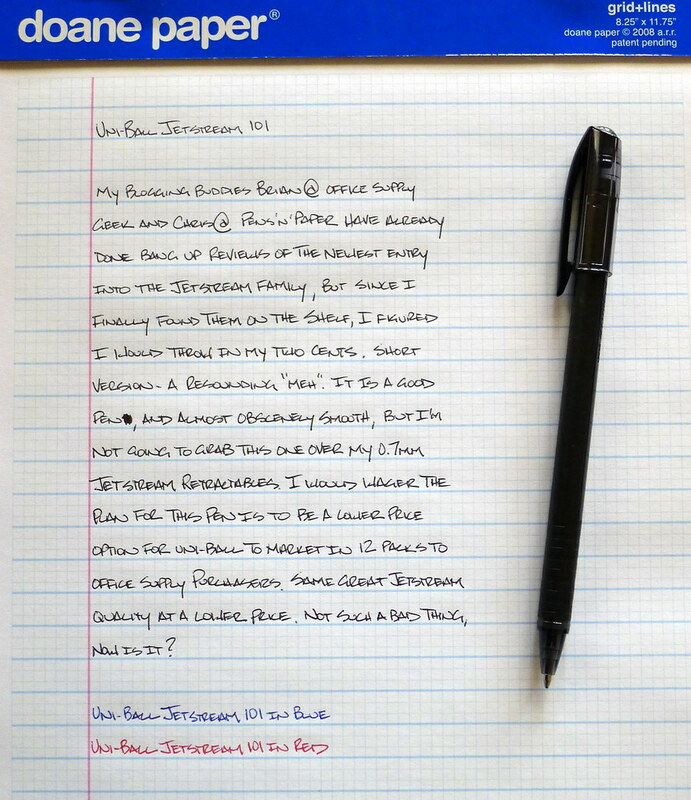 Posted on January 28, 2011 by Brad Dowdy and filed under Jetstream, Pen Reviews, Uni-Ball.